Pictured above is the Samsung Galaxy Tab Pro 12.2 in the 32gB flavor. It is swagged out with a Zagg keyboard case and a Samsung bluetooth mouse. 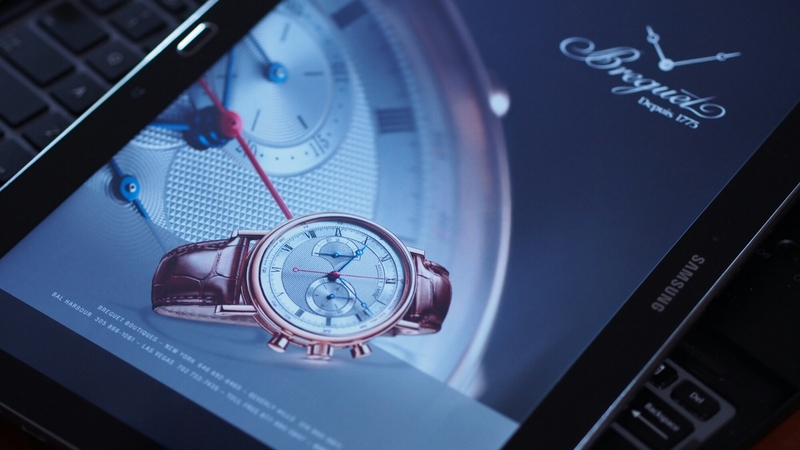 The new Pro series of Galaxy tablets come with Retina level displays and this one just pops colors and details. What really wins me over is the speed which when you run single windowed apps, runs very well on the quad core chip this comes with. Several on line reviews snipe about lag when you run four windows simultaneously -this is a Samsung TapWhiz junky trick that is best avoided. 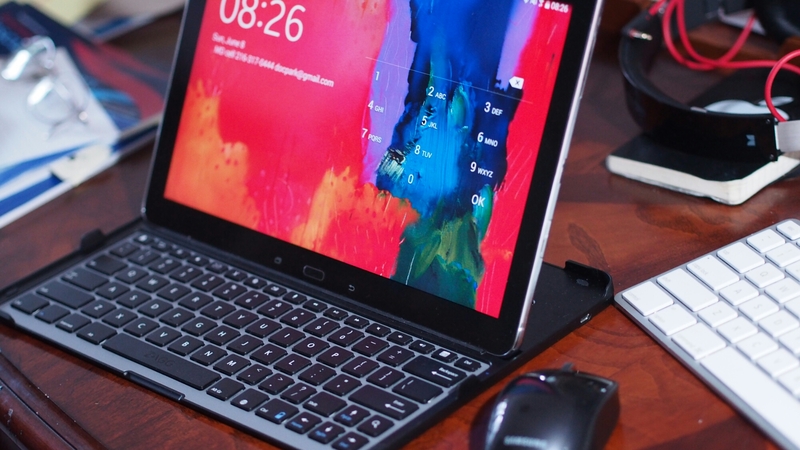 With a keyboard and mouse, it turns the 12 inch tablet into a laptop replacement. Easily going over ten hours of battery time, you don’t have to worry about extra power when you travel internationally or go to work with no cable in your bag. It is pricey and won’t win over bargain hunters -the Google Nexus 7 fills this category, and I think that Google hasn’t released a Nexus 10 II or a Nexus 12, because it wants its clients to have a chance in this world. It kills iPad Air in the screen category -the 10 inch screen on the iPad seems listless and dull in comparison, and I am a certified Apple fan having read the Steve Jobs tome and bought every generation of iPad, including two when the first one came out. I fight daily with my 5 year old who is transfixed by the huge TV like screen. Plus, when I try to work on an iPad, I dream of having a mouse. 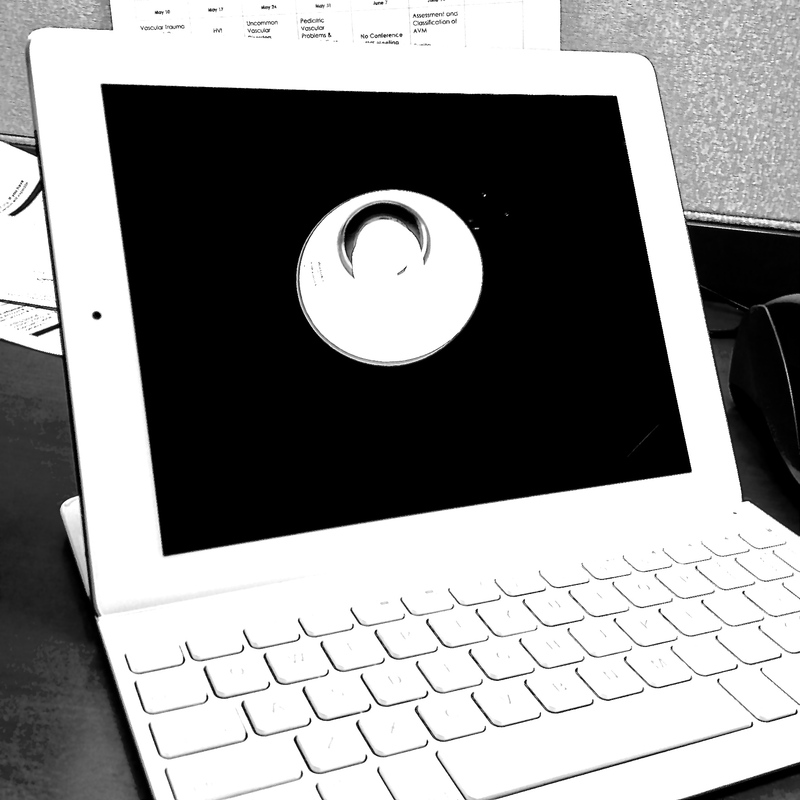 In Android, when you pair a bluetooth mouse, you get a screen cursor. iOS 8 really really needs to support this. Where Android wins for me right now is it has an edge of future now that Apple is losing as it caters to the extremely young and extremely old and the bulge in the middle. Android, because of its near app parity, means for the most part I don’t have to be tethered to the Apple ecosystem. Even iTunes music can be worked around as your library will be sucked up by Google’s music player on your desktop and made available on Android devices and the Chrome browser. Sure, you can’t play your iTunes movie library, but Google is making that less important by offering the same movies, often for cheaper. Also, the Play app is nimble where the Video app on iPad is ponderous and constantly buffering -maybe Google’s pipes are fatter through some payola -who knows. It’s all good. Not like -Best Buy features a Samsung Experience store, where the even cooler penbased Galaxy Pro is displayed but available only by ordering and picking up a few days later. Also, the 64gB version of this tablet was unavailable for immediate pickup and walkout. I get that the iPad’s aren’t available in every flavor, but I don’t understand why every iteration of offered Samsung Tablet isn’t available for immediate pickup and walkout at these store within a stores. Being impatient, I went ahead and purchased with the plan to return if I was disappointed (I am not) and ordering the right tablet from Amazon. Worried -Samsung notoriously ditches its hardware after a year or two, offering maybe one long delayed upgrade in OS or a patch to its Samsung apps here or there (which I just don’t use). I have a bricked Samsung Tablet 2 7.0 in a drawer that won’t power up but I’m afraid of throwing out because of the data in its chips -it died after about three years of steady use. Not Like -while premium pricing implies premium materials, I just see a lot of shiny plastic. Aluminum may bring charges of Apple copying, but they could have gone for a real leather option instead of the plastic leather grain molded back with fake stitching. The large tablet is a real thing and brings work productivity together with media and fun consumption in a way that Microsoft could only dream of. They so badly want this, but can’t seem to get their act together. My Windows 8.1 tablet from Dell lies unused and powered off because it has a crappy screen and has lost its ability to reset to factory condition which I had to do twice after it got junked up with usual Windows crap -detritus of hacky updater files, streamed media and who knows what rapidly filled up the 32gB SSD and made it unstable and unusable. Despite attractive offerings from ASUS and HP and Dell with super sized tablets -basically detachable 18-21 inch all in ones with 4 hour batteries, I ran away. Microsoft has been revealed for what it has long been apparent to me -an enabler of the “Help Desk” in corporate IT who must have problems arise in computers to exist, and a non-thinking agglomeration of hackers who jumble together whatever works -who uses all the features in Word? While I might use Office for Android when it inevitably limps in in 2015, I will still curse it for stupid things like selecting the whole word instead of part of a word without changing an setting. 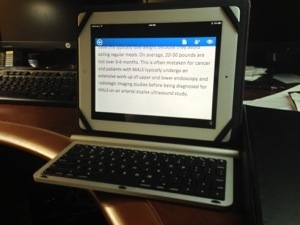 The iPhone version of Office 365 works okay via Bluetooth keyboard on an iPad. No PowerPoint creation or editing, only spreadsheets and word docs. 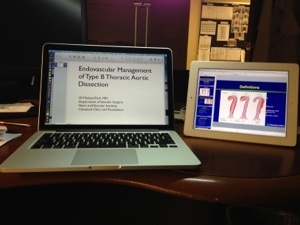 Useful for displaying two presentations at once. Here I am putting together a talk I will be giving in Korea. 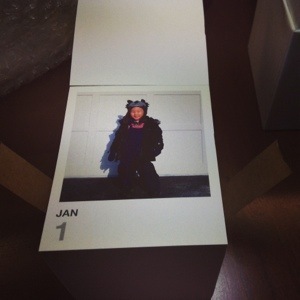 Just received from Printstagram, this Flipbook calendar features 356 square pictures I took last year and can now keep. It comes with a handy box to preserve your calendar sheets. One of the problems with digital media is its impermanence, but this desire to archive is a kind of narcissism. I should be okay when these pictures disappear into the ether like memories but there is a selfish corner of my kind that wants to keep these in a box. After sitting on the fence about purchasing a MacBook Air or an Ultrabook, I finally decided to pass on those items (no Retina display!) 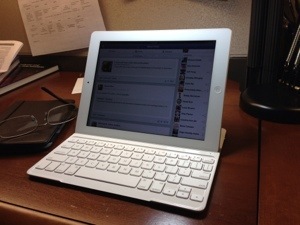 and equipped my current iPad 3 with a Logitech Ultrathin Keyboard Case. I had handed over my Macbook Air 2010 over to my son for school use (and Minecraft play), and was in need of some keyboarded mobile input device. This category used to be all about laptops and netbooks, but this past month Microsoft Surface was released and I did the due diligence of checking it out and rejecting it despite the fact I could have expensed it. Finding a Microsoft Surface to try out is a bit like trying to find authentic takeout Thai food or a Porsche dealership -it’s only available in a handful of places in the US. In the Cleveland area, it means going to the Microsoft kiosk at the Beechwood Mall next to the kiosks selling iPhone covers and fluffy slippers. I thought it was a bust because someone had messed up the Surfaces which were all rebooting. More recently, I got to try the Surface at the local Best Buy. Microsoft in their marketing wisdom decided to widen the release of the Surface in the few weeks before Christmas. Despite the bad marketing, I was impressed by the beauty and speed of the Surface. The keyboard cover was nice and far more responsive than expected. Unfortunately, without the tactile feedback of keypresses it was only a little bit better than a virtual keyboard. I grew weary of it in the first few lines of typing. It gets worse. The Metro interface seems like a tacked on after thought. Launching Office apps caused the screen to jump back into the old Windows desktop screen which doesn’t work all that well with touch, but it keeps lurking in the background waiting to show its big fat corporate OS face whenever it gets the chance. Instead of the Start menu, you jump back into Metro, but how or when you did so was mysterious. I am sure that with use, I would be able to figure out how to turn off the Metro or stay out of the classic Windows desktop. As a casual shopper seeing Windows 8 for the first time, there is mystery involved, and that is not good. I get why Microsoft put out the Surface RT. What Microsoft is battling is the constraints imposed by the demands of the consumer and corporate markets. It has designed Surface RT to the perceived needs of the consumer market. It is making the bet that Office is 90% of what people want on their computers. This is true of laptops and desktops, but not so much for tablets and smartphones. For 90 percent of my work, content creation means translating ideas into text. Who really needs Word to record text? For example, I’m wrote this piece over a week at various intervals on my iPad, iPhone, iPod Touch, and MacBook Pro using Ia Writer, a text processing app that stores the file in the cloud. I never have to press SAVE because there is no such button. When I am ready to make a formatted document, I can do so in any number of apps like Word, Pages, or Google Docs. The fact is, I am using Word less and less because it is unavailable on iOS devices and smartphones, and I think Microsoft is uncomfortable with this trend. Surface is basically recapitulating the most useful configuration for a tablet that you can also do work on -something that the iPad has had since launch which is variations on the keyboard case. 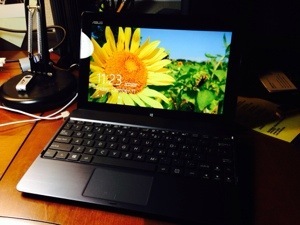 The Logitech Ultrathin Keyboard Cover greatly enhances the iPad as a productivity tool. It latches on like the original magnetic cover and when in laptop mode will prop the tablet with magnets in landscape orientation. The keyboard works perfectly and has many enhancements for iOS oriented shortcuts. 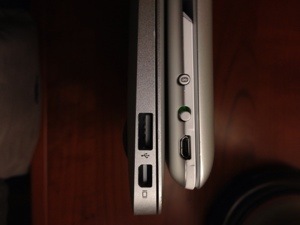 When closed, it looks like a MacBook Air, being clad in aluminum all around, but of course it is thicker. It does offer laptop functionality with a 10 inch Retina display. The keyboard charges via a mini-USB port, and claims a 6 month battery life with two hours of use. It has been seamless and tenacious in gaining and holding a bluetooth link, something that is not always possible with other keyboards. 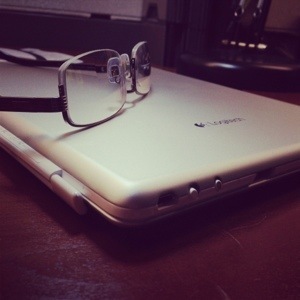 I have been typing on it, and I like it. I can type at full speed. My only gripe is the half height number row which also has a truncated delete key. I still rip off the cover to use it as a tablet and find that the keyboard is on and prevents me from using the virtual keyboard -just remember to turn off the keyboard when not in use. 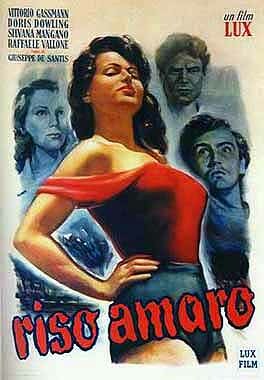 The Surface is a beautiful product but is an evolutionary dead end because its OS, Windows RT, has no past and an arguably a shaky future. Despite creating a product that integrates Office, and makes it basically the only compelling reason to buy a Surface, it does so by making you work in Office in a way that is no different from the 10 pound laptop that IT will give you for business trips. The moment Microsoft releases rumored Office for iOS with full implementation of touch interface, it will have killed any argument for Windows RT. We will see Office for iOS in the App Store one day, but we will have to see Surface die the same way as RIM’s Playbook -in about 8 months before we get to buy it for $129 for the Student and Home Edition. 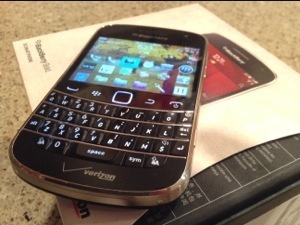 The day has arrived when I get to swap out my Blackberry 9930 for an iPhone 5. I had given up using the Blackberry as anything but a text/phone device because getting on the Internet was tricky at best. The 9930 is a device conceived by a committee of people who don’t understand how people use technology. I used my iPod Touch as a daily communicator and Internet surfer over the BB 9930. Fact is I had high hopes over its beautiful screen and okay keyboard but these could not overwhelm sheer misery in the browser, email (yes email) and paucity of apps to get things done. Goodbye. This is depressing. I kind of flipped when I saw it but the got over it. 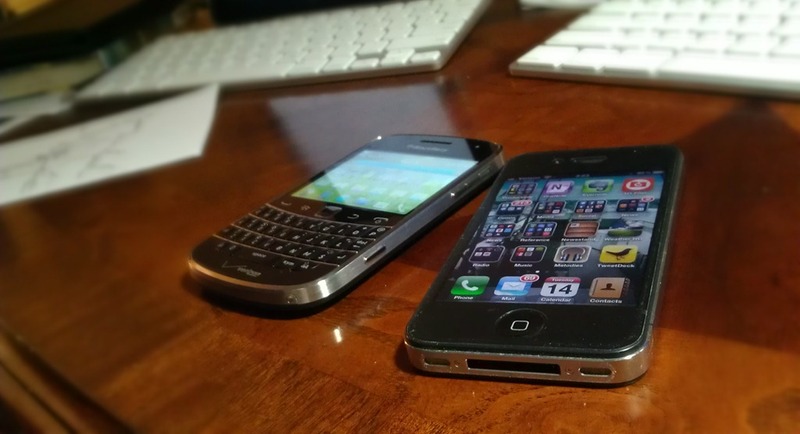 Pictured above are the Blackberry Bold 9930 and the iPhone 4. They demonstrate two divergent approaches to design. The Blackberry has a full QWERTY keyboard and a few more buttons. The iPhone has famously the single button up front, a power, and volume rocker switch. There are people who swear by the keyboard and for them the Blackberry will always be king. Truth be told, there is an appeal to having a physical keyboard for typing out longer pieces, but all of this is trumped by the convenience of a single large screen. There is a principle laid out in The Innovator’s Dilemma (link) regarding disruptive technologies that is at play here. The Blackberry represents the sustaining technology of an established company, RIM which has been putting out keyboarded email communicators since the days of beepers and the Clinton administration. It offers a load of features and the apparent love of corporate IT with its locked down security features. The iPhone and other copycat Android phones are the disruptive technology that paradoxically offers less features, an apparently less accurate virtual keyboard, and the ire of corporate IT and geeks in general for missing lots of buttons, but offers utility in its screen, simple interface, and applications which can turn the iPhone into an infinite variety of gadgets. With evolution of the virtual keyboard, and increasingly higher resolution screens, and soon to be introduced bigger screen, and an app store with over half a million apps, the iPhone is eating the Blackberry’s lunch. This is played out again and again and the established companies invested in their sustaining technologies get rolled over by startups with disruptive technologies that initially offered less or inferior specifications but offered utility with simplification. In vascular surgery, this happened with endovascular technology which compared to classic open vascular surgery appears to offer inferior results on some measures, but offers the utility, particularly to patients, of less invasiveness, fewer dire complications, faster recoveries, and ability to reintervene with acceptable consequences. The Blackberry Bold 9930 is likely the last of its proud kind –highly evolved, beautifully manufactured, but frankly crippled by trying to be more than it should be by adding touch features to its core product –keyboarded email and text. I was told that IT will be swapping all of these out for iPhone 5 in October. Apple isn’t sitting on its hands either. It is disrupting itself with its change of screen size and aspect ratio, with its change from a 30 pin connector to a 9 pin connector, and its introduction of Siri. Siri, while initially viewed with enthusiasm, is being panned for often hilarious inaccuracies which ironically mirror the gaffs of its ancestor the Newton in handwriting recognition, but it is classic disruption. It offers the simplicity of NO KEYBOARD, and the promise of conversing with your technology in meaningful ways. Which leads me to my last point in that in a shifting landscape, you have to be willing to adapt or face the fate of the wooly mammoth, the floppy disk, and even the Blackberry. Addendum: August 15th -I’ve been using this for two days straight. 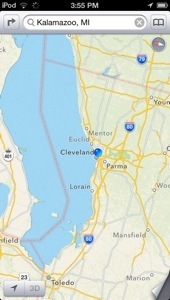 The battery lasts nicely all day -a reflection of RIM’s parsimony with regard to push email, I think. Dropbox and Evernote apps work okay, but the small screen, as sharp as a tack, is still too small and landscape oriented to be useful. While I don’t mind reading at 5point font or less, and am impressed that the display is nearly Retina-display level pixel density, the lack of space is problematic. Also, no obvious way to number lock the keyboard, but the keyboard does contextually switch to a num lock state, I think. The limitation of the OS to 192mB of total application memory is painful to even think about in this day and age. I don’t think RIM has the time to get this right after wasting so much time getting it wrong. Addendum: I do have to remark that the screen on the 9930 is amazingly bright and visible in bright daylight and at all angles. The newest downer of the day is when you update or install an app -you are asked to restart which can take upwards of 2 minutes.